Two full days of fighting, Mom – how are your Foodlandians holding up? Mom: They are fortified with the best vitamins and nutrients, but I see their little food bodies growing tired. I don’t know how long we can hold. How are your Professors? PF: Also waning. The most physical activity they get on a daily basis usually involves eraser-clapping or pencil sharpening. We even had escalators added everywhere since they outlawed stairs forty years ago. Mom: That is not very healthy. PF: Luckily, since the battle started, we have had some great technological advances. Zombie Corn Dog: Arrr! Hopefully the forces of evil will soon prevail! Zombie Corn Dog: Arrr! It is to be hoped that the forces of evil will soon prevail! Zombie Corn Dog: Arrr! Gimme something to bludgeon this robot with! Zombie Corn Dog: *Glug glug glug! * I’m outta here! Prescriptive GrammarBot 3000: OUT OF HERE! OUT OF HERE! OUT OF HERE! Mr. Demon: PROFESSORS! I GROW TIRED OF TOYING AROUND! I AM ACTUALLY GETTING VERY TIRED! ZOMBIE FOOD! ASSEMBLE! Mom: What is he doing to my poor enslaved foodstuffs? PF: They appear to be climbing on top of one another into some kind of clump. Some kind of big ball wad. 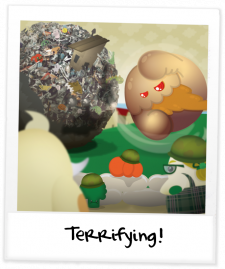 A wad of trapped food spirits. A clump spirit! Mr. Demon: MY SPHERE OF ZOMBIE TRANS-FATTIES WILL ROLL OVER YOUR HOMES AND TRAP YOU IN THEIR STICKY PRESERVATIVE-HEAVY, HIGH FRUCTOSE CORN SYRUP GRIP! PF: Oh no! We cannot possibly create distracting discourse with a giant orb of sticky foods! Mom: Fall back! Fall back to the center of the island! Roy: Hey, that weird comb-over guy is talking to Mr. Demon. Who is that guy? PF: The ball rolls toward us! And it gets bigger with all the things it scoops up! Eekers! Mr. Demon: Follow them, zombie wad! To the Professor Island Library! Blobby: How would he know where the Library is? Roy: It’s that trench coat guy next to Mr. Demon! I smell a rat! Or possibly a possum! PF: I fear we will not be able to fall back, it is too fast! Aiiieeee! Professor Professor: Another giant sphere!? We are doomedsy goners assuredly! PF: Wait, it hit the other giant sphere? It is pushing the zombies away! Bingo Clem: Hey, Buddy! Got your letter! PF: Why it is an equally impressive giant ball made of my friends from the ISLE OF DETACHED SHAWNIMALS! Bingo Clem: Hey, Mr. Fliggins! Heard you needed help from your fellow Detached pals and of course everyone gathered at once! 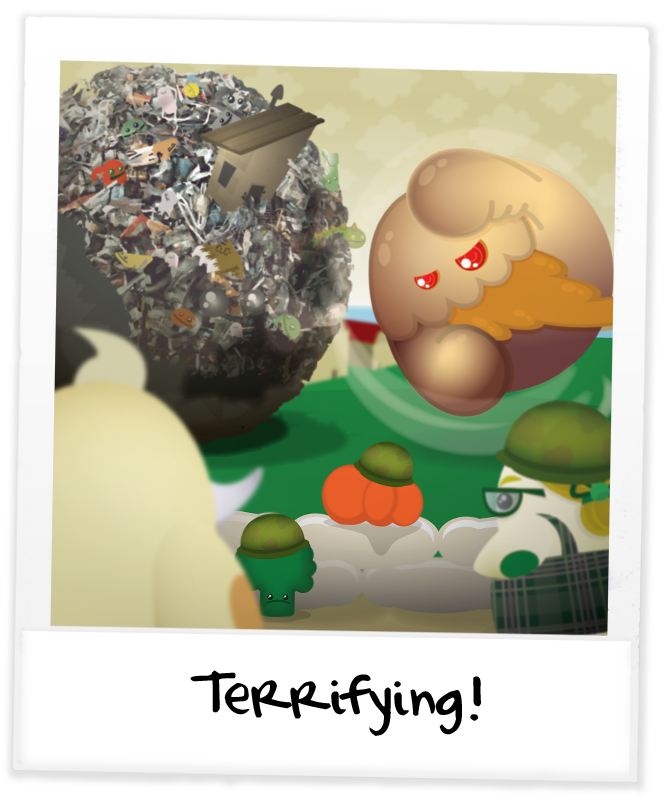 We were so excited, we got all rolled up into this clump of destruction! Bingo Clem: We should have no problem taking on these food zombies! PF: Vice Chancellor, you are a great detached pal to be sure! Mom: Wonderful! Hold your ground, Foodlandians! Reinforcements have arrived! PF: The war is not over yet. But oh golly, I am thankful for these friends. Discoveries Made: Bingo Clem is my friend!